Everyone has to experience the unique Excursions and Beaches in Crete. The island of Zeus offers endless travel possibilities and not only. From palm beaches to high mountain peaks and exciting gorges, a world renowned ancient civilization and a famous traditional cuisine. The 7,000 adventurous years of history awaken the spirits of older guests and younger heroes. 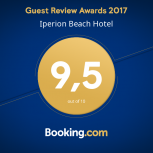 While you enjoy the services and relaxation at Iperion Beach Hotel in Rethymno you may start to explore the island of Crete. 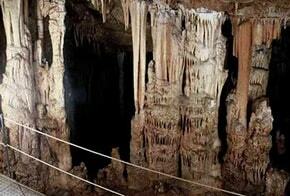 Melidoni Cave is located approximately 1.800m. Northwest of the village of the mountainous Mylopotamos at an altitude of 220 m. on the south side of Mount Kouloukonas. Besides the archaeological significance, the cave is of great historical importance, as connected with one of the greatest tragedies of Greek history. In October 1823, 340 women and 30 men from Melidoni barricaded themselves in the cave to escape the Ottoman army settled in the village until they found them. 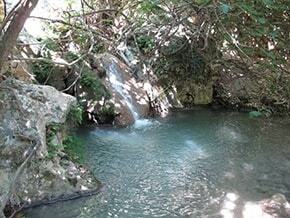 Margarites village is located at an altitude of 300 m. and the distance from Rethymnon is 27 km. 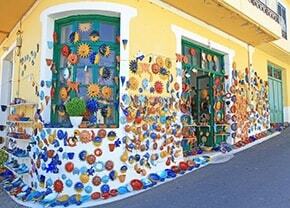 Undoubtedly constitute the most important pottery center of western Crete. In the area there are plenty of clay soil deposits, which explain to some extent the long occupation of the residents with the art of clay. It is very likely for Margarites to have started as a settlement of potters since its inception . Located in the village of Zoniana in the prefecture of Rethymnon It is about one of the most important caves in Greece with an area of 3,000 square meters .The unparalleled beauty in combination with innumerable stalactites and stalagmites will take your breath away. 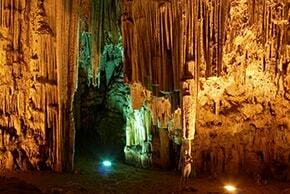 The cave where Zeus was born is located 55 km from Heraklion at an altitude of 1,100 meters. It is the sacred cave on a plateau of Psiloritis where Rhea hid her son Zeus to save him from his father Krono. The archeological findings include bronze statuettes and other offers to the father of all gods. The Minoan palace is the main site of Knossos, an important city in antiquity, with continuous life from the Neolithic period until the 5th century. 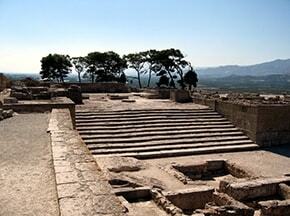 According to tradition, it was the base of the wise King Minos. Exciting myths of the Labyrinth with the Minotaur and Daedalus and Icarus, connected with the palace of Knossos. Phaistos was a Minoan city of Crete, the ruins of which are located 55km south of Heraklion. The city was inhabited by 6000BC while flourished in the city of Knossos, to the 1st century BC. Phaistos is famous for the palace, which is archaeological site and receives thousands of visitors a year. The palace of Phaistos was built on a low hill in the valley of Messara, with panoramic views of the surrounding area. 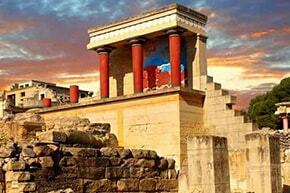 It is the second largest after Knossos, and occupies an area of ​​18 acres. The Palace of Phaistos about 2000BC established in accordance with the legend of Minos. King of the palace was the brother of Minos, the mythical Rhadamanthys. The Rhadamanthus was the son of Europe and Zeus and was known for his justice. Indeed in this attributed the authorship of the Cretan Code, the first instrument of justice rules, which later adopted the Spartans. Due to a fair trial, following the death of the appointed judge in Hades, as the brother of Minos. 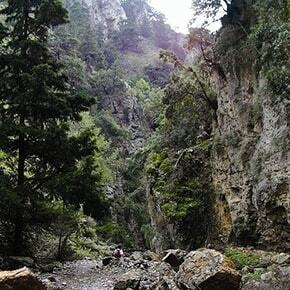 Located 43 km outside the city of Chania and is the longest gorge in Europe (18 km) .The gorge starts at Xyloskalo the plateau of Omalos and ends in the coastal village of Agia Roumeli in South Crete. Flora and fauna in the National Park Samaria will fascinate even the most demanding guests and will have the opportunity to see up close an endangered species that lives only in Crete, Kri-Kri. 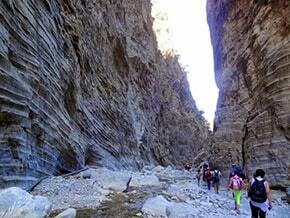 The gorge of Imbros is of the deepest and most narrow gorges of Crete, begins just south of the village Imbros in Askifou plateau to reach after about 5 km in village Komitades near the beach Frangokastello. Mili with its rich natural and architectural beauty is the ideal proposal for walk .Once a few kilometers outside the city, you can enjoy a two hours lasting trail with exceptional flora and fauna and a large number of water mills which were built by locals during the Venetian rule. 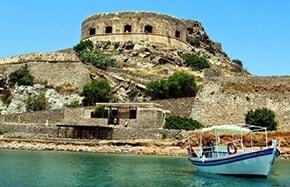 Spinalonga has become known as the island of lepers. This historic island can be reached if you take the boat that runs from Agios Nikolaos, Elounda or Plaka. 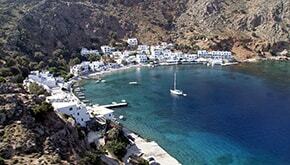 Crete has over 1000 kilometers of coastline to offer, along which have formed beaches to cater for every taste. Beaches with endless stretches of sand, beaches made up only of pebbles. Some of them may be organized and cosmopolitan in tone and others yet deserted and pristine. Beaches suited to unhampered (unsupervised) camping, beaches for diving, snorkeling, fishing and water-sports. Grab your family or partner and start an imaginary journey around the island of Crete where the experiences are endless.We promise to inform you about the most beautiful places around the island. Covering a beautiful drive with your vehicle, you can enjoy your swim in the crystal clear waters south of the county beaches like Preveli, Plakias, Triopetra, Aghios Pavlos, the Ligres, Damnoni, Peach, Frangokastello, the Schinaria or smaller. Elafonisi located on the southwest tip of Crete and is one of the most beautiful beaches of Crete. The unique fact about it that makes it exotic are the small islets with fine white sand that has a tone of pink in several places and turquoise shallow waters. 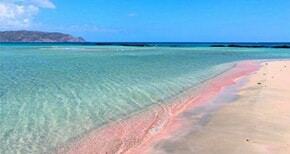 The beach of Balos and the island of Gramvousa located in northwestern part of Crete, in the prefecture Chania. Balos is the exotic beach lagoon formed between the peninsula of Gramvousa and cape Tigani . Gramvousa is the island opposite Balos which are the ruins of a Venetian castle (1579) .The visit to these destinations is by boat departing from the port of Kissamos. The seaside village of Loutro is located at a distance of about 71 km south of Chania in Sfakia province on the tip of Cape Mouri. It is believed that it was the side of the ancient city of Phoenix and also was the port of ancient Anopolis, later became the winter port city of Sfakia, due to the fact that the surrounding bay and the small island at the entrance created a natural harbor where ships can be safe even in very bad weather.